Welcome to Mr. Alligator's home page! Who is Mr. Alligator? Mr. Alligator is a fun little mischief maker with a big imagination. 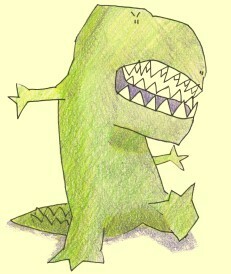 One of his favorite pastimes is pretending to be a mean dinosaur. Despite his gaping mouth and plentiful teeth, he has a hard time scaring people because his teeth are made of felt.